Another crisp winters Sunday afternoon and another battle was about to take place. The 19th of February and the venue was Hunslet Warriors for the WRLA Plate Semi Final clash of the big guns. With Thornhill being a Division One side a lot of people thought this was going to be an easy scalp for them and the easiest path to the final. However, Hunslet, having felt the full force of Thornhill in last season’s competition, to the tune of a 0-40 hammering, really had something to prove this year. Both teams took to the field, with all the players looking pumped up for the game. A good crowd had descended on Warrior Park and a loud cheer went up as Thornhill kicked off. Hunslet returned the ball with full force, getting to 5th and last and putting a good kick in. Now it was Thornhill’s turn to show what they were made of with their first touch of the ball. Nerves showed early and they knocked on at the 4th tackle. Hunslet came again only to run into touch early into the tackle count. Thornhill now finding their rhythm got repeat sets but failed to take advantage. This was the general flow of the game for the next 10 minutes or so, both teams manoeuvring around the pitch, like a prize fighter in a ring, trying to find his opponent’s weakness, but never quite landing the knock out punch. With 12 minutes on the clock Hunslet had a try disallowed after strong running from Chloe Brown and Lana McCabe saw a kick from Gail johnson find Chloe Brown off side. The penalty count now started to climb with both teams finding it difficult to keep possession. Strong running from Thornhill and quick feet from Bethan Oates, they were soon applying pressures on the Hunslet try line only to knock on 5 yards short. Amazing tackling from Aimee McVitee kept Thornhill out again as they kept trying to break down the Hunslet defence. 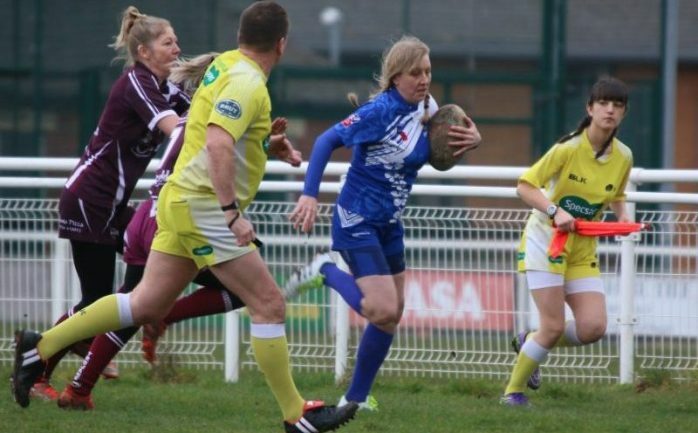 Hunslet mounted their own attack, with good running from Erica Zanre, Lana McCabe and Hayley Portrey Hunslet had the try line in sight, a good kick and Thornhill fumbled the ball to give Hunslet the scrum 15 yards out. With a well worked move off the base Chloe Brown went over for the first try of the match. Gail Johnson added the extras from the touch line. Hunslet were now on fire, returning the ball 60 yards with strong running from Chloe Brown, Lana McCabe and fast feet from Anita Sharrocks. Once again Hunslet lost possession after all this hard work. Both teams were now looking towards half time and you could feel the need for them to get a much needed rest. With both teams revitalised it was back to business. Hunslet kicked off and straight away Lana McCabe put in a bone crunching tackle. Beth Holt gave an amazing offload which saw Nat Kent make plenty of yards only for Thornhill to knock on at the next play. Thornhill’s defence was on point and both Beth Firth and Kathryn Richardson worked together to make sure Hunslet didn’t make much ground. Play after play Hunslet and Thornhill tested the defences, but much like the first half it was down to tacklers like Charlotte Cawthra and Joanne Harrison for Hunslet and Hannah Butcher and Chelsey Holder for Thornhill that kept the score line so tight. It didn’t take long for Thornhill to regroup and come again at the Hunslet line. Piggy back sets and they went over themselves. Bethan Oates scored and added the extras. Thornhill had the win in sight, breaking through the Hunslet line only to be smashed into touch. With a tug of war going on you knew they were still tries in this game, it was only a matter of which team first. 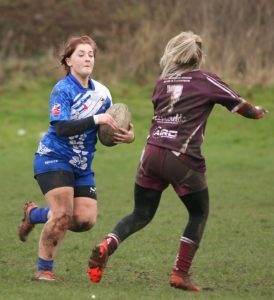 It was Hunslet, with powerful forwards Tegan Halpin, Charlotte Cawthra the attack was set. First a drive, then quick feet from the half back and finally a ball passed down the line saw Nicola Walker over for her 2nd. Conversion hit the bar but failed to fall the right side. Hunslet now opted for safety while Thornhill threw everything but the kitchen sink at them. Hunslet resolve stood firm and the final whistle was soon ringing around the pitch. 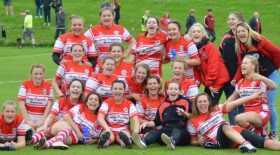 An absolute fantastic game of rugby league played by 2 awesome women’s teams. Well done Hunslet on your win, I hope you play with the same tenacity in the final.